Television is entering a new age of stupid! Should you buy a curved OLED TV? Our survey says... no! The advent of 4K Ultra HD has sparked plenty of debate of late, but the arrival of curved OLED TVs is likely to prompt even more consternation. Yep, for the first time since the advent of widescreen, TVs are changing shape. Marketeers are cockahoop. They finally believe they have a gimmick that can lift sales in the moribund TV market, as well as give nascent OLED tech a reason to commercially exist. Buyers should be rather more circumspect. Advocates are stepping up the hyperbole, with a mantra of "immersion" and "cinematic." Samsung's Head of TV and AV Guy Kinnell even goes so far as to liken the brand's curved OLED S9C as "an IMAX theatre that you can enjoy every day." It's not, of course. Maybe he'd like to make me an offer on the Vauxhall Veyron I've got parked in my drive? So is there really any point in buying a TV that bends it like Beckham? If you're a consumer, absolutely none at all. Of course if you're trying to shift boxes, this is the best wizard wheeze since 3D. Going toe-to-toe with Samsung's Pringle panel is LG's 55EA9800. This is undoubtedly an impressive sliver of technology. It sports a lightweight carbon fibre backpanel and uses LG's own WRGB pixel science for outstanding contrast and improved colour. The images on this panel look beautiful. But its performance isn't helped a jot by the fact that the panel curls like a day-old Kimchee sandwich. "The longer you watch the curved screen, the more immersive it becomes," I was told. This could equally translate to: "Watch it long enough and you'll forget the picture's on the wonk." Thomas Lee, LG's Vice President of Home Entertainment, told TechRadar: "We currently have a lot of research and development going into curved OLED TVs." His words should chill the bones of every AV traditionalist. Both Samsung and LG curved OLED TVs mimic the curvature seen in very large cinemas. Of course, there are sound reasons why a curved screen works within the confines of a large theatre. The concave curve combats pincushion distortion caused by the throw distance of the projector – by carefully bending the screen, projected light is made to strike the entire surface at the same time. There's also the bonus of better brightness uniformity for the popcorn munchers in the stalls. Neither of these points are relevant to a self emissive display technology like OLED. Indeed, rather than create an immersive viewing experience, tomorrow's curvaceous panels can actually be quite distracting, particularly if you draw the short straw and have to sit somewhere off to the side. From this position, your eye is drawn to the bezel and tantalizing back panel decolletage. The curvature on both the Samsung S9C and LG 55EA9800 introduces a sweet spot which doesn't exist on a conventional panel. When you're in this, you don't actually notice the curve at all. It's as if the panel was flat, which makes the exercise rather pointless. Viewed from the side, the image appears a sniff off kilter. But there is an even more practical reason to play it straight - buy a curved OLED tomorrow and you're ruling out the possibility of ever wall-mounting your new super-thin and light display. Curved TVs are tabletop only. This might suit for now, but any plans to wall mount when you redecorate will have to be scrapped. There's only one reason why Samsung and LG are pushing the curve, and that's because they can. You simply can't achieve the same curvey effect with other TV technologies. And in store, the innovation is guaranteed to attract attention. That curved gogglebox is quite an eye-catcher. 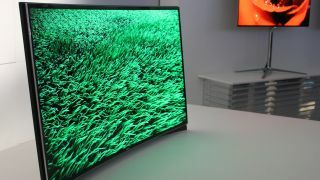 So are curved OLED TVs here to stay? Very possibly. This is TV as high fashion. And fashion and common sense rarely go hand in hand.